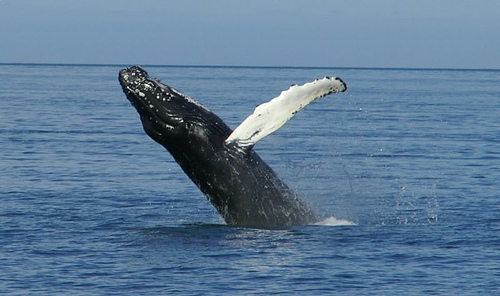 Ok…you want to do some Cape May whale watching! You want to cruise the open ocean in search of that beautiful colossal whale on a guided boat tour. Hoping to get that once-in-a-lifetime glimpse and consider yourself an advanced Cape May whale watcher. We need to get something straight..don’t envision your day having a mammoth humpback whale jump out of the water and onto your boat. The tours that are provided throughout Cape May are fun to go on, but they only guarantee you’ll see 'mammals’. Meaning, you’ll mostly likely see dolphins and would be extremely lucky to see any type of whale. If you have visions of whales flapping their fins and tails or even smiling at you…you may want to try Cape Cod, MA. Sorry to burst any bubble that you probably won’t be the next great whale watcher. But seriously, these ‘mammal’ viewing tours or whale watching tours are actually really cool. 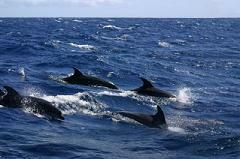 If you have never seen a dolphin up close in the wild, I would definitely check it out! And hey…you never know…you may actually see a whale! There are several tours located right in Cape May and even a few more located within neighboring Wildwood Crest. They all cruise the same waters. If you veg out on the beach for a few days, you’ll most likely see all the boats passing you by. Almost daily dolphins travel up and down the Cape May and Wildwood Crest beaches. It’s a great sight while sitting on the beach…especially if you have some binoculars. But it’s even a better sight being on one of these tours. I would say most days it is a pretty good bet that you see at least a few dolphins. If you get a good day, you could end up seeing dozens upon dozens of them. And you’ll be extremely close! The dolphins are Atlantic Bottlenose dolphins are don’t seem to mind swimming right up to the boats. Sometimes they even right on the boats wake. Awesome view if you get to see this!